SACRAMENTO, Calif. (AP) — California lawmakers expressed dissatisfaction Monday with a plan to change the direction of a $64 billion high-speed railway, with one Assemblyman concerned he could travel through Star Trek's fictional teleportation device before the train would arrive in his district. Assemblyman Adam Gray, D-Merced, said during a joint hearing of the Assembly transportation and select rail committees that he's frustrated by the train's delayed timeline. Previous blueprints would have run the first high-speed trains between Merced and the San Fernando Valley by 2022; the latest plan delays that service by seven years. "It makes me feel like I'm going to be with Captain Kirk on the transporter before I'm going to be on high speed rail," Gray said. High Speed Rail Authority Chairman Dan Richard and Chief Executive Officer Jeff Morales apologized to Gray for failing to notify officials in his Merced district of the major change in the business plan to build the rail northbound before going south. Gray encouraged them to tell lawmakers how they can help speed the project. Lawmakers so far have played only a limited role in high-speed rail. Assemblywoman Cheryl Brown, D-San Bernardino, said she was also troubled by the change in direction. "This way, it looks like we won't have any kind of access to the money that we, as the citizens of the Inland Empire, put into the pot," Brown said. Richard and Morales said that Southern California will be the first to see funding for other mass transit projects. "Even though the trains may arrive north first, the dollars are going to arrive south first," Richard said. The new plan calls for building the first 250-mile segment from the rural town of Shafter to San Jose at a cost of nearly $21 billion. The first leg would begin operating in 2025 — three years later and 50 miles shorter than the original planned route that would have sent trains to the San Fernando Valley. Project backers are touting it as the first plan to build a fully operable line using only available funding. But a briefing prepared for lawmakers ahead of Monday's meeting notes: "The funding outlined by the authority is far from guaranteed and associated risks remain high." The Legislature approved the first long-term funding source for high-speed rail in the 2014-15 budget, giving it a quarter of funds from fees charged to polluters, about $500 million a year. 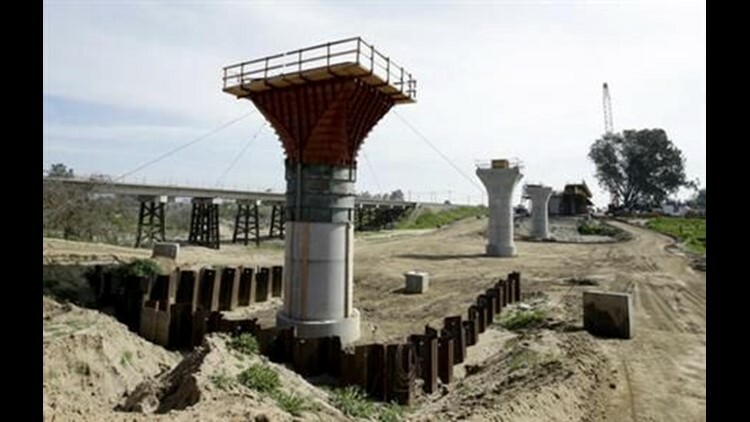 The rail project also has about $3.2 billion in federal stimulus funds and nearly $10 billion in bond money approved by California voters in 2008. Public concern has increased as land acquisition got underway in the Central Valley. A poll last week by the Public Policy Institute of California, however, found a slim majority of Californians still support high-speed rail; though support is much more enthusiastic with a lower price tag. The state's independent legislative analyst this month urged the Legislature to become more involved, suggesting that it require more detailed planning on the cost, scope and schedule of each high-speed rail segment.